We spend most of our time snorkelling or diving for some project or research, but we love scuba diving on our day off… and especially when you know that the ocean will be teamed with fish and you may make an encounter with a Frogfish which are also called Anglerfish. Cryptic and masters of camouflage, the diving instructor had to point it out tome from very close before I could actually see it, despite its bright color. 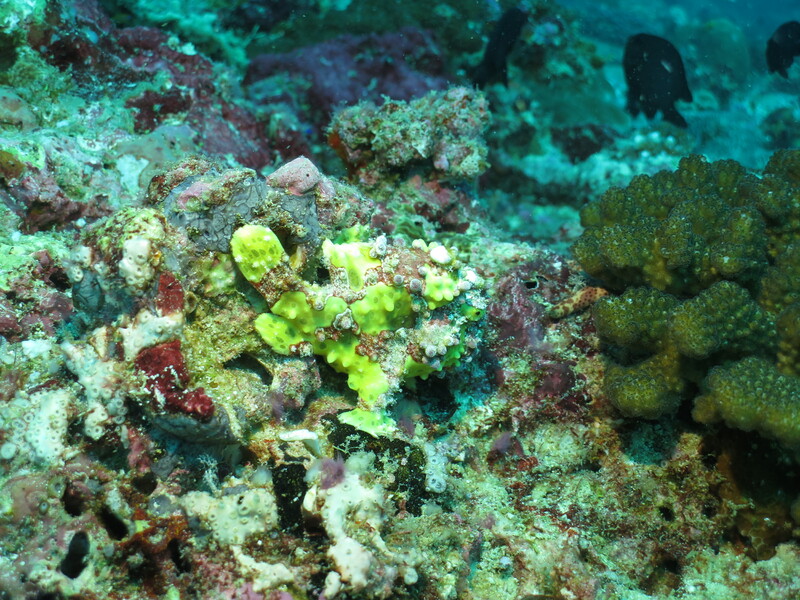 They mostly blend in with the background they are sitting on, such as sponges, rocks and rubble, being almost always very close to a place they can quickly hide into. Through their pictures we have a lot of material for a game we play at the Den: “Spot the hiding animal”. Their names derive from two of their typical features. They are called Anglerfish for having a lure on their head dangling right in front of their huge mouth and attracting unaware preys which they capture with a fast movement; Frogfish both for the shape of their mouth and the way they move. They lack the swim bladder, and their fins have evolved more into feet than fins and hence spend a lot of energy for moving, which they do by hopping around following the current or using jet propulsion pushing the water from the mouth through the gills right behind their pectoral feet-fins. We hope you’ll see one of this lovely fish while diving with the Soleni Dive Center or with a huge amount of luck even by snorkelling.